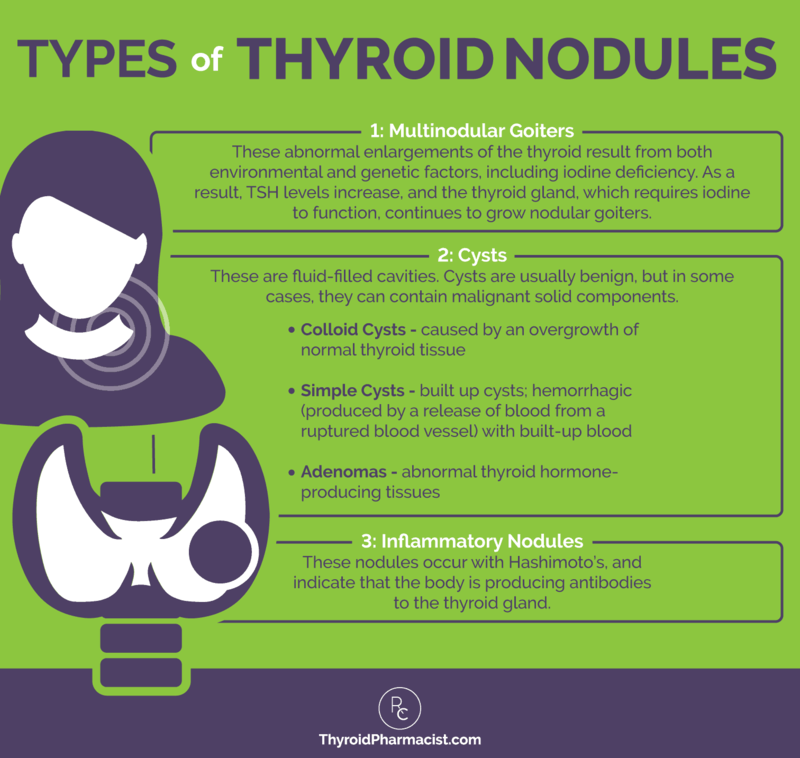 I recently had the pleasure of connecting with a lovely lady who was very concerned about her thyroid nodules. She was a new mom who had just given birth and found that the nodules she had on her thyroid had grown. She was planning on getting them biopsied and potentially removing her thyroid, and wanted to know what her options were for addressing this concern. Up to 50 percent of our population has thyroid nodules. 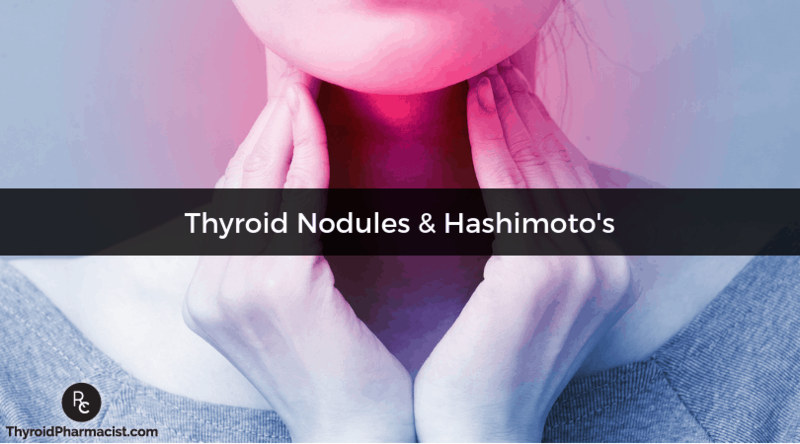 Nodules are also more common in those with Hashimoto’s — so chances are, if you’re reading this article, you may have a nodule (or even multiple thyroid nodules). The lab results of one of my readers who had been exposed to Chernobyl and was able to get 3 nodules to disappear! Nodules are defined as “solid or fluid filled lumps” within the thyroid gland and can vary in size and location. Most nodules will not cause symptoms and will only be discovered during a manual examination of the thyroid gland or during a thyroid ultrasound. However, large nodules may result in a visible swelling of the thyroid or neck; and they can cause pain, difficulty swallowing, and/or difficulty breathing. Some types of nodules can actually produce thyroid hormones, which can result in hyperthyroidism. 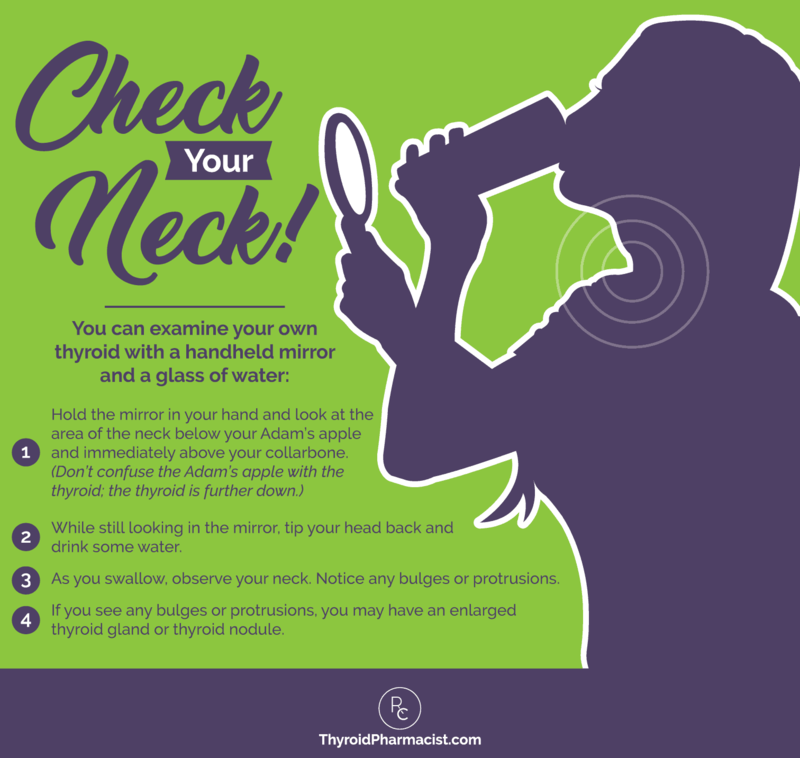 Many people with Hashimoto’s have thyroid nodules, and in fact, detecting the presence of thyroid nodules is a common way to diagnose autoimmune thyroid disease. Having thyroid nodules is one of the most common endocrine conditions in the United States. About 50 percent of American adult ultrasonographic examinations (a safe medical procedure where sound waves bounce off bones and tissues in the body to produce a black and white image on a monitor) reveal thyroid nodules (4). Women are three times more likely to have nodules: about 30 percent of women in their 30s will have at least one, and most women will develop a thyroid nodule by the time they are 50. While over 90 percent of thyroid nodules are benign (non-cancerous), certain nodules may be malignant (cancerous). Some thyroid nodules are actually cysts filled with fluid, rather than thyroid tissue. Purely cystic thyroid nodules (thyroid cysts) are almost always benign. The complications stemming from inflammation associated with Hashimoto’s can put you at greater risk for other autoimmune diseases, as well as thyroid cancer (including thyroid lymphoma). Research shows people with Hashimoto’s have a much higher risk for thyroid cancer than those without Hashimoto’s (around 22.5 percent versus 2.4 percent) (8). The risk of having thyroid cancer increases if you have a family history of thyroid or endocrine cancer, if you’re younger than 30 or older than 60 years old, if you are male, or if you have a history of radiation exposure (including dental and chest X-rays). There is typically a delay of 20 years or more between radiation exposure and the development of thyroid cancer. To learn more about diagnosis, please read my article on thyroid cancer. I’ll detail how to test for cancerous nodules below. The signs and symptoms of nodules aren’t always so apparent. You may notice them yourself as a lump on your neck, while buttoning your collar. Or, your doctor might only discover nodules during a physical exam or on imaging tests like ultrasounds or CT scans for other reasons. Abnormal thyroid test results may also be an indicator that a person should be examined for nodules. 2. Check your thyroid hormone levels to ensure they’re in the optimal ranges. Note: Be sure to request a full thyroid panel (TSH, free T4, T3, reverse T3). You can read my article on the top 10 thyroid tests for more information on how to order your own thyroid panels and interpret your results. Should you suspect nodules from your physical self-exam or from suboptimal thyroid hormone levels, you may wish to consult your physician to order an ultrasound. 4. Follow up with a fine needle aspiration (FNA) biopsy. If your doctor suspects a nodule might be malignant, he or she might perform a fine-needle aspiration (FNA) biopsy. A FNA is usually only considered when nodules are larger than 10 mm in diameter, unless ultrasound results are otherwise suspicious. Additionally, nodules ≤5 mm are generally monitored rather than biopsied. A FNA biopsy involves the insertion of a very thin needle into the thyroid, and cells are aspirated (removed) for further evaluation. A FNA biopsy helps determine whether the nodule is a true nodule (malignant) or a pseudo-nodule (benign). While this is the gold standard to differentiate between benign, inflammatory, or malignant nodules (classifying them as either true nodules or pseudo-nodules), it is invasive. A more non-invasive technique to differentiate pseudo-nodules and true nodules is sonoelastography, where ultrasonography imaging is used to evaluate the mechanical properties of soft tissue. Research shows sonoelastography can be an effective alternative to avoid using invasive biopsies or surgical interventions to detect a true nodule diagnosis (12). Once your physician determines you have nodules, he or she will likely refer you to an endocrinologist for further treatment. Newer tests can also help specialists better determine whether nodules are benign or cancerous. One of them is the American College of Radiology (ACR) Thyroid Imaging, Reporting, and Data System (TI-RADS). This test scores various features of nodules on an ultrasound, and assigns points to help users of the report with recommendations. The higher the total score, the higher the chances of malignancy. 5. Another method of diagnosis is to get a thyroid scan done. An isotope of radioactive iodine is injected into a vein in the arm to find nodules that produce an excess of thyroid hormone. (These will take up more of isotope then normal thyroid tissue.) You may find cold or hot nodules. Cold nodules are non functioning and appear as defects or holes in the scan. Hot nodules are almost always non-cancerous, while only some cold nodules are cancerous. 1. Observation. When you have benign nodule, most doctors will recommend monitoring your thyroid with regular checkups (ie. physical exams, thyroid tests, and follow up biopsies) to check for malignancy. This is especially important for those with Hashimoto’s, as they are at an increased risk of thyroid cancer. An increase in size or symptoms may demand a repeat biopsy or another treatment, but nodules that don’t change over the years might not require any additional treatment. 2. Thyroid hormone suppression therapy. Prescribing thyroid hormone replacement medications can lower the production of TSH from the pituitary gland, and thus decrease the growth of thyroid tissue. Some practitioners may even attempt to suppress TSH with thyroid medications, to reduce nodule size. One double-blind, placebo-controlled study looked at 123 patients with a single palpable benign nodule, using levothyroxine therapy to suppress their TSH below 0.3 mIU/L over 18 months. The study found that those in the medication group had a significant decrease in the size of their largest nodules, while the placebo group saw an increase in nodule size (23). 3. Surgery. Surgery may be recommended when a benign nodule is large in size and causing difficulty when breathing or swallowing, when there are diagnosed large multinodular goiters, or when goiters constrict airways, the esophagus or blood vessels. Surgery is also recommended when nodules are suspected to be cancerous. Options include a total thyroidectomy (where the entire thyroid gland is removed) and a partial thyroidectomy (where only parts of the thyroid are removed). I’ve seen countless times where people have had their thyroid glands removed due to thyroid disease (most commonly Graves’ and thyroid cancer). In the case of autoimmune thyroid disease, removing the thyroid with a thyroidectomy eliminates thyroid antibodies, as there is nothing left to attack. However, life is not always roses with a thyroidectomy, as it does not remove the autoimmunity. Furthermore, a thyroidectomy may result in difficulty breathing, bleeding or infection, injury to the parathyroid glands near the thyroid (which could cause low blood calcium levels or neuromuscular symptoms), and permanent hoarseness or voice changes due to nerve damage. You can check out my article about getting a thyroidectomy for Hashimoto’s for more information. Although the above treatment options can reduce or remove thyroid nodules, I have heard many success stories of people reducing or eliminating their nodules with dietary and lifestyle interventions. I’d like to share the success story of a client who was able to reverse her nodules with nutrition, supplements and treating Blastocystis hominis. Her thyroid antibodies are also now in the remission range (she is not taking any thyroid medications). This 60 year old woman with asthma, Hashimoto’s and past exposure to Chernobyl had consecutive ultrasounds on an annual basis to monitor her thyroid nodule. As of 2018, this person still does not have any nodules on her thyroid ultrasound. She did, however, have a flare in asthma and thyroid antibodies in 2017 after having dairy. As a side note, I think the significant dairy reactivity may be due to the Chernobyl exposure and the radioactive toxins concentrated in the milk from cows in Eastern Europe. My theory is that this exposure made people highly sensitized to dairy proteins. FINDINGS: There is a 6 x 3 x 4 mm hypoechoic solid nodule in the right lobe with multiple small but discrete hyperechoic foci likely due to calcifications. There is a 2 x 4 x 2 mm partly calcified solid nodule in the left lobe that demonstrates shadowing. IMPRESSION: There are bilateral calcified thyroid nodules. The nodules measure under 1 cm in diameter. The nodules are nonspecific in appearance and results should be correlated with clinical and laboratory data. Follow up ultrasound needed in 12 months due to the calcifications. FINDINGS: The right lobe of the thyroid measures 1.4 x 1.3 x 3.8 cm. Left lobe of the thyroid measures 1.6 x 0.9 x 3.9 cm. The isthmus measures 3 mm in thickness. Right lobe: Lower pole, posterior, lateral, well circumscribed intermediate echogenicity. Central calcification. No increased vascularity. 0.3 x 0.4 x 0.3 cm. Prior studies do not demonstrate a nodule in this location, however a larger calcified nodule was identified previously in a more superior location of the thyroid gland. The previously measured nodule is not demonstrated on this exam. It is possible that the small nodule measured today represents a decrease in size of the previously seen nodule in the change in location relates to imaging technique. This nodule is indeterminate. Continuing thyroid ultrasound follow-up is recommended. Left lobe: Mid thyroid, mid gland well-circumscribed. Intermediate echogenicity. Calcified. 0.2 x 0.3 x 0.1 cm. Previously measured 0.3 x 0.2 x 0.1 cm. This calcification/nodule is stable to decreased in size compared to prior ultrasound consistent with a benign finding. IMPRESSION: I suspect that the right sided calcified nodule described above in the lower pole today represents the previously measured thyroid nodule and has decreased in size consistent with a benign finding, however the differences and described location of the nodule may direct correlation difficult. Continued ultrasound follow-up is recommended. FINDINGS: The right lobe measures 3.4 x 1.2 x 0.8 cm. The left lobe measures 3.8 x 1.0 x 0.9 cm. The isthmus measures 0.3 cm in AP dimension. The gland is mildly heterogeneous. Color imaging demonstrates increased vascular flow bilaterally. A coarse calcification in the left lobe measures 3 mm, interpolar. This is stable. There is no discrete nodule. IMPRESSION: No suspicious nodule identified. The previously described right thyroid nodule is no longer seen. A coarse calcification on the left measures 3 mm, nonspecific but stable and of doubtful significance. This is unchanged dating to the earliest available exam of 11/05/2010. As you can see, her latest ultrasound test showed that her nodule had disappeared! Chronic inflammation of the thyroid (thyroiditis) – The chronic inflammation associated with autoimmune thyroid conditions increases the risk for thyroid nodules (7), and the inflammation associated with autoimmune thyroiditis can further enlarge nodules. With Hashimoto’s, the body develops antibodies to normal proteins produced by the thyroid gland, which in turn can result in the development of malignant (possibly cancerous) nodules. Your thyroid might also form pseudo-nodules (or benign nodules) that come and go. Nutrient deficiencies in iodine, selenium, and vitamin D – Iodine deficiencies typically occur in diets lacking iodine, and can result in a multinodular goiter. However, this is unlikely to occur in North America where iodine is added to foods, as is the case with iodized salt. With Hashimoto’s, iodine excess is far more likely to create nodules. You can read more about how iodine affects Hashimoto’s. That said, vitamin D deficiency is quite common. This vitamin controls the way in which cells grow and divide, and insufficiency increases one’s risk of nodules, fibrosis and polyps in many areas of the body. Selenium deficiency is also a potential cause of nodules, as studies suggest that selenium supplementation can result in improved thyroid ultrasound features and smaller nodules (25). Toxins – This is oftentimes an overlooked culprit for nodules. A 2015 study in Sicily found that people living closer to a petrochemical complex, and thus are subject to its pollution, were more likely to have a greater frequency of thyroid nodules as well as Hashimoto’s (6). Radiation exposure, such as being exposed to Chernobyl, can also cause nodules (38). Additionally, a 2017 study found that thyroid nodules were more likely to be found in those with both autoimmune thyroid disease and a nickel allergy (20). Further research is needed, but this supports the idea that toxic exposure, like nickel toxicity, may play a role in the development of nodules in those with Hashimoto’s. Pregnancy and hormonal changes – Often times, women develop thyroid nodules during pregnancy, and pre-existing thyroid nodules may grow during pregnancy (26). A recent study done in Hong Kong saw an increase in the number of the thyroid nodules and well as their size over a period of 10 to 12 weeks apart each trimester of pregnancy. The growth of the nodules appeared to be much faster than what is normally seen in non-pregnant women. While the cause of nodules during pregnancy remains unclear, the study suggested that this could be due to negative iodine balance associated with pregnancy (26). H. pylori infections – H. pylori infections have been considered a trigger of Hashimoto’s and have been found in almost 50 percent of patients with Hashimoto’s in one Iranian study. (You can read more about that in my article on Hashimoto’s and H. pylori.) A 2013 study found that H. pylori infections were associated with the presence of thyroid nodules in individuals, despite having normal thyroid function (27). Given that the theory of molecular mimicry suggests that the immune system may attack its own thyroid gland when it is infected with a pathogenic organism that looks similar to components of the thyroid gland, it’s possible that such an infection increases the autoimmune attack on the thyroid, resulting in the development of thyroid nodules. Blastocystis hominis infections – I have heard anecdotal stories from my clients and readers claiming that addressing a Blastocystis hominis infection resulted in the elimination of their nodules. I suspect the reason behind this is similar to why H. pylori infections are associated with the development of thyroid nodules. Another hypothesis I have relating to the role of infections in thyroid nodules, is that nodules may be created when a foreign substance (like bacteria) is inserted into the body and the body reacts by trying to wall it off by forming a capsule of scar tissue around it. Food and diet – We know that food sensitivities can exacerbate the attack on the thyroid and increase one’s levels of chronic inflammation, which, as I mentioned earlier, has been linked to the development and enlargement of nodules. Additionally, based on anecdotal stories from clients who have shrunk their nodules through dietary interventions that remove common inflammatory foods, it’s possible that food sensitivities contribute to the development and growth of thyroid nodules. I’ve received numerous reports from clients and readers who were surprised that their nodules disappeared after following the Paleo or Autoimmune Paleo diets. Please note: this approach works over months, sometimes years. Additionally, blood sugar imbalances can also lead to a greater risk of thyroid nodules (39). That is why I believe that a number of dietary and lifestyle changes can help improve symptoms of Hashimoto’s and reduce the size of thyroid nodules. Address nutrient deficiencies in iodine, selenium, and vitamin D – While iodine deficiency is rare in those with Hashimoto’s, those that are indeed low in iodine may benefit from taking a multivitamin with iodine, like Nutrient 950 from Pure Encapsulations. A dose of up to 250 mcg of iodine per day has been found to be helpful and beneficial in people with Hashimoto’s; however, doses above 300 mcg can be potentially inflammatory. Vitamin D and selenium supplementation may also help. You can read more about addressing vitamin D and selenium deficiencies in my articles. Clear out toxins – Supporting your liver’s detoxification pathways as well as opting for non-toxic, natural personal products can greatly reduce your body’s toxic burden and result in optimal thyroid health. Check out my article on liver support for more information. Change your diet and remove food sensitivities – Balancing your blood sugar can help with shrinking thyroid nodules. Removing common food sensitivities like gluten and dairy can also help reduce the size of your nodules. Check out my article on food sensitivities for more information on how to identify them. Consider smart supplementation – Some of my readers have reported an elimination of nodules utilizing the systemic enzyme Wobenzym, and others with turmeric. Address estrogen dominance – Excess estrogen can be a trigger for thyroid nodules. In the case of excess estrogen due to pregnancy or using birth control pills, the estrogen will likely rebalance on its own with time after you have your baby or stop the pill. If a year has passed since you had a baby or stopped the pill, or if your estrogen dominance is due to other reasons, consider using food, supplements and progesterone to balance out your hormones. I’ve written an article on how to recognize the symptoms of estrogen dominance, and one on the birth control pill. Consider echotherapy (HIFU ablation) – New research suggests that a single session of high-intensity focused ultrasound (HIFU) ablation, which uses focused ultrasound energy to induce thermal ablation (removal), may be more beneficial (and safer) than a thyroidectomy for symptomatic but benign thyroid nodules. In one study, patients who underwent HIFU ablation did not scar, had a shorter hospital stay, and were less likely to have voice pitch issues a month after their treatment. Furthermore, those in the study saw a greater improvement in symptoms and a lower prevalence of subclinical hypothyroidism compared to those who had surgery. While this treatment is currently only available in a few clinics in Europe, further studies may be conducted in the future to explore its efficacy as a possible thyroidectomy alternative (36). Nodules are often present in those with Hashimoto’s and may be detected with a thyroid panel and ultrasound tests, but most nodules are benign. While thyroid medication can help address thyroid hormone imbalances, they may not always get to the root cause of the nodules alone. Fortunately, benign nodules may be reduced or even eliminated with dietary changes, strategic supplements, and other innovative lifestyle changes that address the underlying root causes of Hashimoto’s, as discussed in my book Hashimoto’s Protocol. This comprehensive plan has helped many patients feel better and get their thyroid disease into remission, and I hope these changes help you as well! You can also download a free Thyroid Diet Guide, 10 thyroid friendly recipes, and the Nutrient Depletions and Digestion chapter for free by subscribing to my weekly newsletter. You will also receive occasional updates about new research, resources, giveaways and helpful information. McAninch EA, Bianco AC. Thyroid hormone signaling in energy and energy metabolism. Annals of The New York Academy of Sciences. 2014;1311:77-78. Koulouri O, Moran C, Halsall D, Chatterjee K, Gurnell M. Pitfalls in the measurement and interpretation of thyroid function tests. Best Practice & Research Clinical Endocrinology & Metabolism. 2013;27(6):745-762. doi:10.1016/j.beem.2013.10.003. Andreoli TE. Essentials of Medicine. 7th ed. New York, NY: Elsevier; 2007. Bianco AC, Kim BW. Deiodinases: implications of the local control of thyroid hormone action. Journal of Clinical Investigation. 2006;116(10):2571-2579. doi:10.1172/JCI29812. Tomer Y, Huber A. The etiology of autoimmune thyroid disease: A story of genes and environment. Journal of Autoimmunity. 2009;32:231-239. Arena S, Latina A, Baratta R, Burgio G, Gullo D, Benvenga S. Chronic lymphocytic thyroiditis: Could it be influenced by a petrochemical complex? Data from a cytological study in South-Eastern Sicily. European Journal of Endocrinology. 2015;172(4):383–89. doi:10.1530/eje-14–0864. Takashima S, Matsuzuka F, Nagareda T, Tomiyama N, Kozuka T. Thyroid nodules associated with Hashimoto thyroiditis: assessment with US. Radiology. 1992 Oct;185(1):125-30. Boi F, Lai ML, Marziani B, Minerba L, Faa G, Mariotti S. High prevalence of suspicious cytology in thyroid nodules associated with positive thyroid autoantibodies. European Journal of Endocrinology. 2005 Nov;153(5):637-42. Contempre B, Dumont J, Ngo B, Thilly CH, Diplock AT, Vanderpas J. Effect of selenium supplementation in hypothyroid subjects of an iodine and selenium deficient area: the possible danger of indiscriminate supplementation of iodine-deficient subjects with selenium. J Clin Endocrinol Metab. 1991;73(1):213-215. Amdur RJ, Mazzaferri EL. Measuring urinary iodine. Essentials of Thyroid Cancer Management. New York, NY: Mazzaferri, Springer Science + Business Media, Inc; 1989:215–19. Food and Nutrition Board, Institute of Medicine. 2000. Selenium. In Dietary Reference Intakes for Vitamin C, Vitamin E, Selenium, and Carotenoid. Washington, DC: National Academy Press. 284–324. Durante C, Costante G, Lucisano G, Bruno R, Meringolo D, Paciaroni A, et al. The natural history of benign thyroid nodules. JAMA. 2015 Mar 3;313(9):926-35. doi: 10.1001/jama.2015.0956. Chistiakov D. Immunogenetics of Hashimoto’s thyroiditis. Journal of Autoimmune Diseases. 2005;2:1. Kroger-Ohlsen MV, Trugvason T, Sklbsted LH, Michaelsen KF. Release of iron into foods cooked in an iron pot: Effect of pH, salt, and organic acids. Journal of Food Science. 2002;67(9):3301–03. Mohommad MK, Zhou Z, Cave M, Barve A, McClain CJ. Zinc and liver disease. Nutr Clin Pract. 2012;27(1): 8–20. DeLuca HF, Cantorna MT. Vitamin D: Its role and uses in immunology. FASEB Journal. 2001;15:2579–85. Anil C, Kut A, Atesagaoglu B, Nar A, Bascil Tutuncu N, Gursoy A. Metformin Decreases Thyroid Volume and Nodule Size in Subjects with Insulin Resistance: A Preliminary Study.Medical Principles and Practice. 2016;25(3):233-6. Choi WK, Kim J. Dietary Factors and the Risk of Thyroid Cancer: A Review.Clinical Nutrition Research. 2014 Jul; 3(2): 75–88. Thyroid nodules. Mayo Clinic. https://www.mayoclinic.org/diseases-conditions/thyroid-nodules/symptoms-causes/syc-20355262. Published February 18, 2017. Accessed July 4, 2018. Norman J, Clayman G. Thyroid nodules. Endocrine Web. https://www.endocrineweb.com/conditions/thyroid/thyroid-nodules. Updated June 7, 2018. Accessed July 4, 2018. McHenry CR, Phitayakorn R. Follicular Adenoma and Carcinoma of the Thyroid Gland. The Oncologist. 2011;16(5):585-593. doi:10.1634/theoncologist.2010-0405. Ventura M, Melo M, Carrilho F. Selenium and Thyroid Disease: From Pathophysiology to Treatment. International Journal of Endocrinology. 2017;2017:1297658. doi:10.1155/2017/1297658. Shen Z, Qin Y, Liu Y, Lu Y, Munker S, Chen L, et al. Helicobacter pylori infection is associated with the presence of thyroid nodules in the euthyroid population. PLoS One. 2013 Nov 11;8(11):e80042. doi: 10.1371/journal.pone.0080042. Marks L. What is a Thyroidectomy? Everyday Health. https://www.everydayhealth.com/thyroidectomy/guide/. Updated October 23, 2015. Accessed September 26, 2018. Clayman G. Thyroid Nodules. Endocrine Web. http://www.endocrineweb.com/conditions/thyroid/thyroid-nodules. Updated August 30, 2018. Accessed September 26, 2018. Mayo Clinic Staff. Thyroid nodules. Mayo Clinic. http://www.mayoclinic.org/diseases-conditions/thyroid-nodules/basics/definition/con-20021546. Accessed September 26, 2018. Gharib H, Papini E, Paschke R. Thyroid nodules: a review of current guidelines, practices, and prospects. European Journal of Endocrinology. 2008;159(5):493-505. https://doi.org/10.1530/EJE-08-0135. Gharib H, Papini E, Garber JR, Duick DS, Harrell RM, Hegedüs L, et al. American Association of Clinical Endocrinologists, American College of Endocrinology, and Associazione Medici Endocrinologi Medical Guidelines for Clinical Practice for the Diagnosis and Management of Thyroid Nodules–2016 Update. Endocr Pract. 2016 May;22(5):622-39. doi: 10.4158/EP161208.GL. Bragg R. Does Elimination of Gluten From the Diet Help Shrink Thyroid Nodules?. Healthfully. https://healthfully.com/549017-does-elimination-of-gluten-from-the-diet-help-shrink-thyroid-nodules.html. Accessed September 26, 2018. Liver Doctor. What to do for thyroid nodules. Liver Doctor. https://www.liverdoctor.com/what-to-do-for-thyroid-nodules/. Accessed September 26, 2018. Liver Doctor. What to do for thyroid nodules. Liver Doctor. https://www.liverdoctor.com/what-to-do-about-thyroid-nodules/. Accessed September 26, 2018. Busko M. Echotherapy: A Future Option for Benign Thyroid Nodule Symptoms?. Medscape. https://www.medscape.com/viewarticle/881235. Published June 7, 2017.Accessed September 26, 2018. Cahoon EK, Nadyrov EA, Polyanskaya ON, Yauseyenka VV, Veyalkin IV, Yeudachkova TI, et al. Risk of Thyroid Nodules in Residents of Belarus Exposed to Chernobyl Fallout as Children and Adolescents. J Clin Endocrinol Metab. 2017 Jul 1;102(7):2207-2217. doi: 10.1210/jc.2016-3842. Chen Y, Zhu C, Chen Y, Wang N, Li Q, Han B, et al. The Association of Thyroid Nodules with Metabolic Status: A Cross-Sectional SPECT-China Study. Int J Endocrinol. 2018 Mar 6;2018:6853617. doi: 10.1155/2018/6853617. How about a thyroid nodule caused by radium treatments as a child? Can I buy your books in any bookstores? What is your position in respect to the Broda Barnes Basal Temperature Test Method vs comprehensive blood testing for thyroid function? Davin – thank you for reaching out. <3 That's a great question and unfortunately I don't have any information to share with you at this time but, I will add this to my list of future article possibilities. I would like to ask the function of NAC(N-Acetyl Cysteine) supplement and recommended daily allowance of NAC. Can this NAC be useful to reduce thyroid anti-body(TPO & TgAB)? Hi, I remember a while back you had mentioned low level red light therapy and some successful in some small scale studies in reducing nodule size. Any new updates on that therapy? Tommy – thank you for reaching out. The root cause treatments that I recommend for Hashimoto’s may also potentially be helpful for Vitiligo. Any infection or toxin can produce these symptoms of autoimmune disease. Also, with Vitiligo, antibodies may cross-react with the thyroid. Susan – thank you so much for reaching out and sharing your journey with me. I am so proud of you for taking charge of your health and I am happy to hear you are feeling better. Unfortunately I don’t have any information to share with you at this time on Bioresonance but, I will add this to my list of future article possibilities. I would love to hear more about your experiences here on this page! I have 2 thyroid nodules, discovered in the beginning of 2018. The first fine needle aspiration and pathology was inconclusive, so we waited 6 months and did another biopsy. My endocrinologist ordered a genetic test on the specimens and I’m happy to say, they were found benign. As little as 6 years ago I would probably have had surgery. I am working on some of your protocols to shrink them and have also had some acupuncture. It was very strange. 3 fine needles on the side of my neck that had the nodules and one on the other side, connected by wire and alligator clips. Three quick shocks were applied. I had read about a clinical trial that was done using such a procedure and it was very successful. Time will tell. Thank you for all your work!! I am 31 years old. I found a nodule on my thyroid 2 weeks after my son was born. It was biopsied and came back benign. We just checked it again 6 months later and it has grown and now the biopsy came back abnormal. All of my blood work and TS levels have been normal and I have no symptoms. If it wasn’t for the lump, I wouldn’t even have known. The doctor is recommending removing the thyroid because my mom had thyroid cancer when I was younger. I am concerned that I am jumping straight to surgery before considering all of my options. I am just scared that if it is cancer, I don’t want to wait to take action. I am looking for any options and steps I should take. Do you have any thoughts? Sara – thank you for reaching out and sharing your journey. I am so sorry you are dealing with all of this. My heart goes out to you. <3 Most thyroid conditions result from the immune system attacking the thyroid because the immune system is out of balance. Even when the thyroid is taken out surgically, is ‘dead’, or treated with radioactive iodine the autoimmunity still persists in most cases. Many people will have their thyroids removed, and will develop new autoimmune disorders such as Lupus, Rheumatoid arthritis, etc. The immune system just finds a different target. My question is, is it possible to heal it naturally? is’nt it to late? I do not know exacly when they appeared. Iwona – thank you for reaching out. I am so sorry you are struggling with this. Nodules and goiters are often the result of toxicity and/or the autoimmune process. So, doing interventions to reduce the autoimmune attack on the thyroid, and toxicity, can be helpful to reduce them. Most thyroid conditions result from the immune system attacking the thyroid because the immune system is out of balance. Even when the thyroid is taken out surgically or treated with radioactive iodine the autoimmunity still persists in most cases. Many people will have their thyroids removed, and will develop new autoimmune disorders such as Lupus, Rheumatoid arthritis, etc. The immune system just finds a different target. We need to rebalance the immune system to prevent this. Sometimes the autoimmunity can be reversed as well! The gut determines your immune system. With the exception of discussing proper thyroid medication dosing, the majority of my website and my book focuses on balancing the immune system. The info I present is based on my own research and journey for overcoming my autoimmune thyroid condition.Have you read my books? I have not read your books yet, i watched your movies on youtube, but will try, i struggle since over 10 years, but just do not “inside” feel that this is a good solutions. I have never believed in medicaments, its syntetic, but didn’t have any better idea of what to do. I’ll try to get this book. Iwona – thank you for reaching out and sharing your journey. I understand how overwhelming and hard this can be. <3 Most thyroid conditions result from the immune system attacking the thyroid because the immune system is out of balance. Even when the thyroid is taken out surgically or treated with radioactive iodine the autoimmunity still persists in most cases. Many people will have their thyroids removed, and will develop new autoimmune disorders such as Lupus, Rheumatoid arthritis, etc. The immune system just finds a different target.